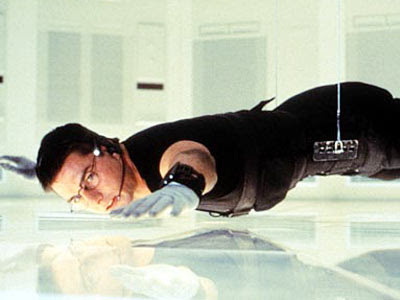 On the very cusp of finally realizing a moment of relaxation, at the most critical point of dropping off into peaceful nap, Ethan Hunt hears the disturbing rattling buzz of his highly customized iPhone 4. "Dammit! What now?" He pounds his fist into the tray table that lays out in front of him. The rumbling is in stark contrast to the tranquil ambiance of the super-secret G650 that simply whispers though the early morning air. Good morning, Mr. Hunt. Your mission, should you choose to accept it, involves the recovery of a limping NHL organIzation, "the Thrashers of Atlanta." You may select any two random billionaires for potential ownership transfer... They must be willing to keep the team in Atlanta, but it is essential that the third member of your team be me, Jim Balsillie. I am a Canadian patriot, and a highly capable NHL ownership candidate. You have forty-eight hours to recruit the other two investors and meet me in Hamilton, Ontario to receive your assignment. As always, should any member of your team be caught or killed, my secretary will disavow all knowledge of your actions. And Mr. Hunt, the next time you are contacted by Steve Jobs, please be good enough to let us know. This message will self-destruct in five seconds... P.S. There is a new BlackBerry Torch 9800 waiting for you in the overhead compartment above. Now quite obviously, this fantasy could never be reasonably constructed. Balsillie would never be part of a scheme to backdoor engineer a move of a NHL franchise, while working under the guise of keeping it in it's current city. Right? Who's with me on this? Not to mention the fact of how silly it would be to think he would message someone in possession of an iPhone! The reality is that the Atlanta Thrashers are for sale. 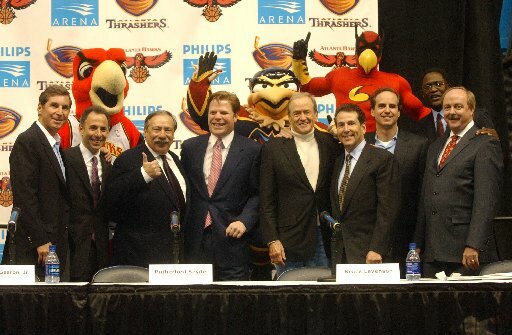 Since taking over the Atlanta Hawks, Thrashers and Philips Arena in 2003, the chaotic disaster that is the Atlanta Spirit Group claims that they have "'incurred over $130 million in out-of-pocket losses' while operating the Thrashers". They wanted to own a NBA franchise. Check. They realized that with the Hawks. Sadly, their purchase agreement with Time Warner stipulated that along with the Hawks, they buy the Arena and that hockey team that plays there as well. They went along with it. They pretended to be interested in hockey for a couple of years and then have tried, unsuccessfully, to sell the Thrashers ever since. With attendance, local television ratings and merchandising revenues near, or at the bottom of the league, coupled with the exodus of every star that has come to play there, fan interest has declined with that of ownership. It's no wonder that they have not been able to find a buyer in those six years. The Atlanta metro area has more than enough resources to support a NHL club. It's why the league has chosen to pursue the market... twice. Taking over from the apathetic current ownership group, a pathetic marketing plan (that has consistently pushed the arena, "Blueland", over the game and players for years), poor TV ratings, no merchandising, and bottom of the barrel attendance figures in a market in which they have almost no brand awareness, is hardly an attractive package to sell to prospective NHL owners. By purchasing the Thrashers, the new owner not only gets the aforementioned package, but also the financial mess that has lost an average of $16.25 million per year since 2003.
but wait... there's more! Keeping the team in Atlanta means having to generate local interest. To do that the new owners get to spend more money!!! (flashing lights, bells ring, etc...) Woo hoo! More money on PR in community outreach. More money on advertising, marketing and promotions. More money on payroll! Yes, they must add to the near cap-minimum payroll to gain star power in an effort to win more games, which should in turn, draw fans back to the arena. Yes, the same arena which the NHL club now would no longer own, but must lease from that same awful ownership group they bought from! The final insult to injury. Take on a business that is losing money and you get to add expenses too. What business person/investor/investment group would be interested in taking on that mission? Other than the US Federal Government, we can't think of another group that would want that kind of sure failure. Because of the structure of the Spirit Group and their investment holdings, selling the hockey entity alone, is Mission Impossible. 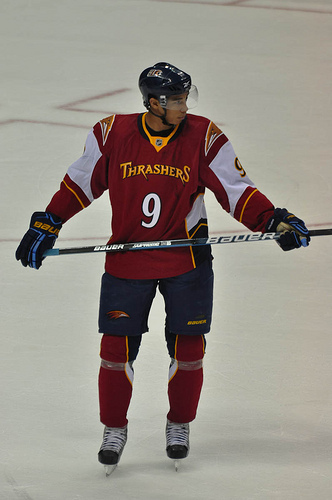 The NHL will soon be forced to accept the reality that Evander Kane should be sporting a re-issued Jets or Nordiques sweater in the near future. This message will self destruct, when proven otherwise.